Door Handles and Ironmongery Are Go! Handles4Homes is Proud to Announce the Launch of it's New Website! Door Handles Online! Handles4Homes have moved from their old web platform to a socially connected platform which has given them a closer connection to their customers. Adam Copsey, Director: "We've already seen the benefits of the re-development and we're definitely looking towards a brighter future on this platform." The New Web 2.0 Look and Feel! The website was easy to navigate and use, the checkout worked well and delivery was very quick. Handles4Homes specialise in online sales of all types of architectural hardware and ironmongery. Including door handles, door knobs, Hinges, Kitchen Cabinet Handles and Knobs. Traditionally Handles4Homes have focused on the UK market, but with the level of growth they have seen with the new web platform, they will soon be expanding into international markets. The big change in driving new business was finding the right BigCommerce partner/developer and engaging with them to produce the perfect platform and structure for us to move our business forward with. Adam Copsey, Director H4H said: "Using the BigCommerce platform has been one of the best business decisions we could have made, it's connected framework has allowed us to interface with our customers in way that was previously not possible on our old website." 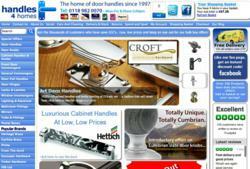 Door Handles have been the largest growth area on our new website. But we are rapidly expanding our stock to grow into other areas of the online Ironmongery sales market, as the site and our brand continues to grow, we definitely have a handle on it. Handles4Homes is part of Sitemaster Supplies and have been trading in the UK for 15 years. They are seen as experts in the Ironmongery and Architectural Hardware, supplying to many prestigious property development companies across the uk.